My nickname is Action Jackson. I went to Aiea High. My hat size is 8. My sister is Nicole, 31. My beautiful mom is Dottie and my pops is Armond. My favorite place to skate near home is A‘ala Park. My favorite place to skate in the world is The Streets. I ride for FITTED, APB and Lakai. My favorite skater of all-time is Sean Payne. I listen to anything from Prince to Weezy to Journey. I like to watch Family Guy. I’m a FITTED Skateboarding Team fan. When I’m not skating I like to fish. My career goal is to own a handy man business. I represent for Hawai‘i by doing what I do best: skateboarding. 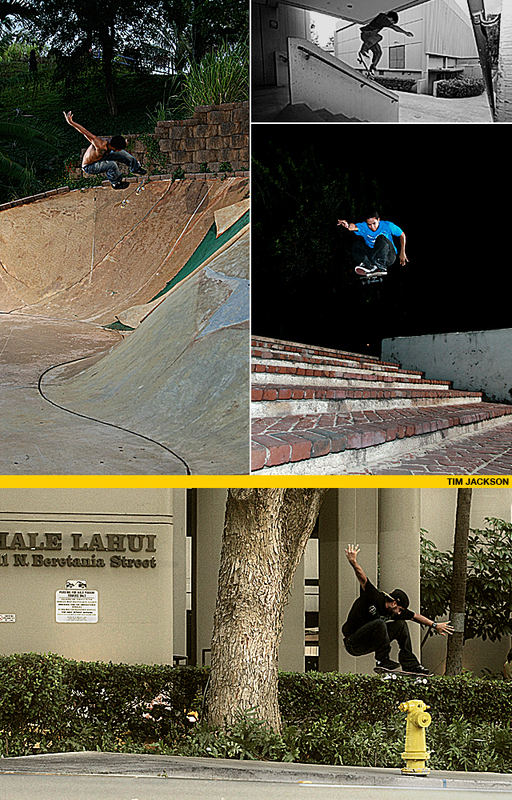 Family, friends, all my sponsors: APB, FITTED, Lakai and God.